Highly durable fingerprint device with advanced fingerprint reader technology for use under any conditions. 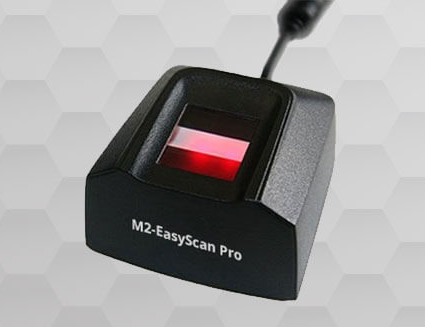 An affordable fingerprint device for large scale or small scale fingerprint identification, the M2-EasyScan Pro™ single fingerprint reader is a specialized fingerprint scanner from M2SYS with an advanced optical system that can capture high quality images in seconds. It’s thick, anti-scratch coating on the scanning surface endures long term heavy duty usage in any harsh environment without any difficulty. With high image quality specifications for single fingerprint readers, the scanner is built to capture single fingerprint images from dry, moist, aged, scarred, and difficult to scan fingers for greater accuracy and reliability. Highly durable and rugged – proven to resist electrostatic shock, impact, drops, scratches, extreme temperatures, humidity, electrostatic discharge, and contaminants (sweat, dirt, oil, etc).